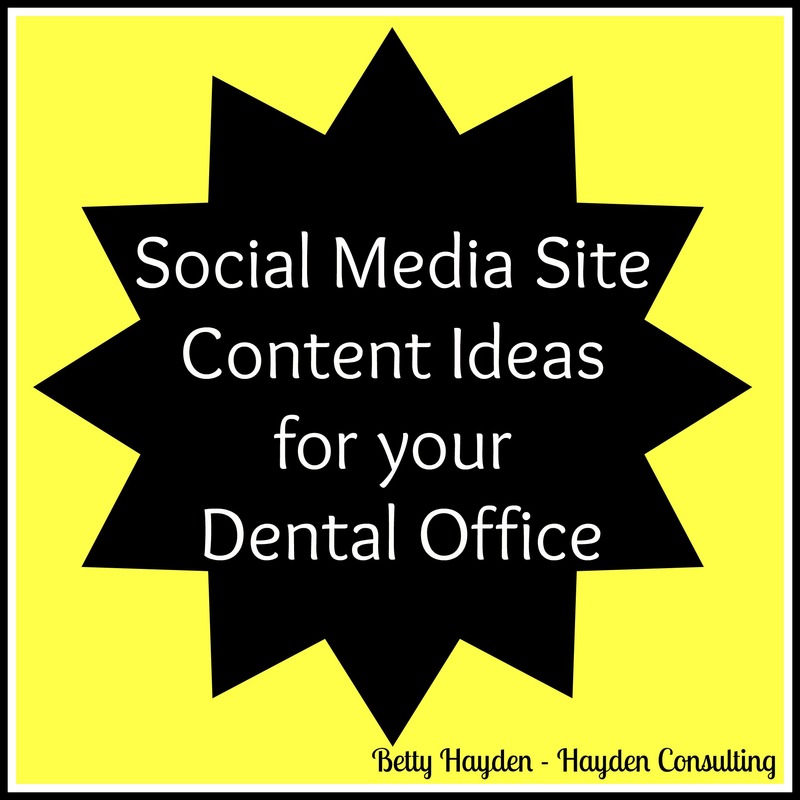 Social Media Site Content Ideas for your Dental Office – Hayden Consulting – Where Your Success in Business and Life Matters! Many offices wonder what types of things they should post and share on their social media sites. Vary the topics you post about. No one wants to only see dental related posts. Remember, WIIFM (What’s In It For Me?) Appeal to your audience. Your current and potential patients. Vary the times you post or share on your social media sites. Don’t spam with too many posts in a day. Acknowledge all “like” and “comment” on your posts. Openings in Schedule (Don’t say “we have a cancellation” instead say something like: “_ has an opening in her schedule today at 11:00 for your all important dental hygiene visit…” Whatever you say, saying change in schedule is better than saying cancellation. I understand that not all business owners (Doctors) & team members can find the time required to start and grow a social media site presence. I happen to love working with social media as a dental marketing source. I’m ready to help your practice grow through the use of Social Media sites. Fresh content and posts just for your office! Done in a way that your patients and potential patients believe it’s coming straight from your office. Feel free to comment below and share your ideas and what content works well for your office. Be sure to subscribe to receive our free dental marketing ideas right to your email inbox. This entry was posted in Customer Service Tips, Dental Success, Marketing Ideas, Practice Management and tagged betty hayden, betty hayden dental consultant, chiropractic marketing ideas, dental cross marketing, dental customer service, dental marketing, dental marketing ideas, exceed patient expectations, exceeding patients expectations, facebook for dentists, hayden consulting, how can i use social media sites in my dental practice, how to bring in new patients, how to fill the schedule, how to grow your chiropractic office with social media, instagram for dentists, marketing ideas, marketing ideas for dentists, social media content for chiropractic offices, social media sites, twitter for dental office, what should i post on facebook. Bookmark the permalink. Hey there! My office has been doing occasional staff themed days/photos for Social Media. We are looking for monthly ideas on ways to dress up to holidays/sports events/etc. but we’re kinda stuck on Feb-April. Do you have suggestions? Hello Rose, Absolutely! February is Heart Health Month you could pick a day that the team all wears red. Also, March is Mad for Plaid Month and Dr. Seuss Day: 2nd. Luau day would be fun during these cold winter months. Pingback: Ten Ways to Stay in Touch with your Dental Patients – Hayden Consulting – Where Your Success in Business and Life Matters!